� During the 2013 AVP season, Brunner and Lucena began the year with 10 losses in the first five events, and nine came at the hands of either the first or second seeds. 2018: Brunner played five AVP tournaments alongside John Hyden, winning once while finishing thrd three times. Brunner tied for first in blocks (1.92 per set). On the FIVB Tour Brunner and Hyden played seven times, getting a best of fifth twice. 2017: Brunner and Casey Patterson played five times on the AVP Tour, with a best of third twice. Brunner was third in hitting percentage (.480) and fifth in blocks (1.75 per set). Brunner and Patterson played in nine FIVB tournaments, with a best of fourth in a four-star event. 2016: Brunner played once with Sean Rosenthal, finishing ninth, then began a partnership with Billy Allen. Brunner and ALlen played five AVP tournaments together, winning once and finishing third once. Brunner ranked second on the Tour in blocks (2.05 per set) anbd seventh in hitting percentage (.445). Brunner played seven FIVB events, three times with Rosenthal and four times with Allen, including a best of ninth after playing in the qualifier. 2015: Brunner played just two AVP events, both with Sean Rosenthal, getting a best of fifth. On the FIVB Tour, Brunner played eight times with Nick Lucena and three alongside Sean Rosenthal. Brunner and Lucena played in two FIVB semifinals, with a best of fourth. 2014: Brunner played with Todd Rogers, and in seven AVP events had a best of 2nd. Brunner led the Tour in blocks per set (2.12) and was seventh in hitting percentage (.412). Internationally the duo won a bronze medal in their five FIVB events together. Brunner concluded the FIVB season with events with John Mayer and one with Nick Lucena. 2013: Following two years without playing, Brunner formed a partnership with Nick Lucena and the duo placed third in their first tournament together. In the seven AVP events, the duo had five semifinal appearances including two second-place finishes and a win in the season finale in Huntington Beach. They ended the season tied as the second-ranked team on tour. Brunner was the AVP's top blocker, averaging 2.22 blocks per game. Internationally Brunner played two NORCECA events with Lucena, winning in San Diego. 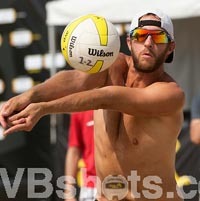 He also played one FIVB event with Todd Rogers, placing 17th, and once with Casey Jennings, finishing 33rd. 2010: Brunner started the season with his first time being seeded directly into the main draw in a Virginia Beach event with Jon Mesko, placing 25th. He finished 13th in his other two events, both with Mansfield. 2009: After being eliminated in the qualifier in the first two events alongside Aaron Mansfield and Matt Heagy, Brunner qualified for his first main draw in Brooklyn with Derek Olson, placing 25th. He then finished the year with four tournaments playing with Mansfield, with the duo advancing from the qualifier each time. They placed 17th in Manhattan Beach and ended the year with a 13th in Chicago. 2008: Brunner played in two qualifiers, once with Andrew McGuire and once with Phil Silva. 2007: Made his pro beach volleyball debut with Ben Brockman, losing in the qualifier in the Manhattan Beach Open. College: Brunner made an impact early at Cal-Santa Barbara, setting a school season record for hitting percentage as a freshman. He was the only Gaucho to play in every game his sophomore season. He was an AVCA First-Team All-American as a junior, and left the school in the top 10 in career kills and blocks. He graduated with a Bachelors in Philosophy. Personal: Brunner is the third of four children, with older brother Max, older sister Emily and younger sister Lydia. In high school he was an all-state volleyball player and led his team to a state championship his senior season. His 1,050 kills set a school career record. Brunner was also a three year letterwinner in basketball, earning all-conference honors. Brunner married Ioanna Klironomou in 2015.